To Cite: Azimi S A, Sadegh Nia H R, Mosavi Jarrahi A, Jamaati H R, Kazempour Dizaji M, et al. Ectopic Expression of miRNA-21 and miRNA-205 in Non-Small Cell Lung Cancer, Int J Cancer Manag. 2019 ; 12(1):e85456. doi: 10.5812/ijcm.85456. Background: Lung cancer is the leading cause of death, related to cancer in both men and women. MicroRNAs (miRNAs) play key roles in regulating the genes that are responsible for apoptosis, and regulation of gene expression. MicroRNA expression is deregulated in cancer. Many efforts have been made to detect cancer biomarkers. Extracellular miRNAs, which are directly released from tumors, can be detected in circulating blood. Objectives: The aim of this study was to examine the expression of miRNA-205 and -21 in lung cancer patients relative to healthy controls. Methods: This cross sectional study was performed in 50 healthy blood sample controls and 50 non-small cell lung cancer (NSCLC) blood samples. The expression of two miRNAs (miR-21 and miR-205) in peripheral blood mononuclear cells (PBMCs) was evaluated, using real-time polymerase chain reaction (real-time PCR) techniques. Statistical tests were carried out via the Mann-Whitney test. Results: The miR-205 levels of expression in the patients with lung cancer significantly increased in comparison to healthy controls (6.8 ± 0.42 and 1.2 ± 0.19, respectively), (P = 0.014). The expression of miR-21 in lung cancer (5.2 ± 0.52) significantly increased compared to the control group (1.6 ± 0.14) (P < 0.001). Conclusions: Based on our findings, lung cancer can enhance the ectopic expression of several miRNAs, which, in turn, play key roles in impaired apoptosis and further cancerous progression. Cancer is characterized as a group of diseases induced by uncontrolled cell growth and stimulated tumor metastasis and formation (1). Worldwide, lung cancer is the leading cause of death associated to cancer. Historically, lung cancer is divided into two important categories, non-small cell lung cancer (NSCLC) and small cell lung cancer (SCLC), with the former consisting mostly of squamous cell carcinoma, adenocarcinoma, and large cell carcinoma (1). Generally, 75% to 85% of global lung cancer cases are NSCLCs. At present, more than 70% of people with NSCLC have highly advanced cancer (2, 3). Lung carcinogenesis occurs from a variety of factors, such as deactivation of tumor suppressor genes or activation of the oncogenes. As a result, the molecular differentiation of NSCLC and SCLC is uncertain. So, understanding these mechanisms will be developing therapeutic approaches for the treatment of human NSCLC (4-6). MicroRNAs (miRNAs) are small single-stranded RNA molecules with 18 to 25 nucleotides in length. They have the potential to modulate gene expression at the post-transcription level. miRNA can inhibit and degrade target gene expressions by binding to the 3′ untranslated region and produce the complex on the targeted gene. In the past decade, the regulatory role of miRNAs has been studied on cancer biology. In normal cells, miRNAs control genes that are involved in cellular growth, differentiation, proliferation, and apoptosis. Unsurprisingly, miRNAs, which prevent genes from involving in cell cycle progression, are often down regulated in cancer cells (7-9). Different studies indicate that miRNAs are potential molecules for cancer therapy, because they have tumor suppressor functions and potential biomarkers for cancer diagnosis (10, 11). miRNA-21 (miR-21), one of the first recognized and best-established miRNAs in human cells, has been studied in various diseases such as cancer and cardiovascular diseases. Evidence has demonstrated that in lung cancer, the expression of miR-21 is controlled by epidermal growth factor receptor signaling (12-14). miRNA-205 (miR-205) is found in a lung cancer-related genomic amplification at 1q32.2 region. Recently, it has been revealed that the loss of miR-205 stimulates the transition of epithelial tissue to mesenchymal tissue during tumor progression. A previous study has suggested that SMAD4 expression is regulated by miR-205 through targeting its 3’-UTR in NSCLC (15). Our study investigated the expression of miR-205 and miR-21 in NSCLC and compared it to healthy controls. Fifty blood specimens of patients with lung cancer, who received surgery resection or biopsy for NSCLC at the Department of Clinical Laboratory, Masih Daneshvari Hospital (Shahid Beheshti University of Medical Sciences, Tehran, Iran) and 50 blood sample of healthy individuals were collected. The healthy sample featured normal bronchoscopy reports-no history of illness, no smoking, and no history of using anticancer drugs. Cancer sample patients were those in the early stages with no distant metastasis. Chemotherapy, radiotherapy, and surgery were not performed on any patients. All samples were finally confirmed with histopathology examinations. All the protocols used in the present investigation, including human subjects, were initially reviewed and approved by the Ethical Review Board of Masih Daneshvari Hospital. Additionally, in accordance with the Declaration of Helsinki, written informed consent was obtained from each participant. The clinical pathology characterizations are below in Table 1. For prepared total peripheral blood mononuclear cells (PBMC) isolation, 5 mL blood samples were mixed with anticoagulant. PBMCs were isolated from whole blood samples by using Ficoll-Paque Plus (GE Healthcare, United Kingdom) density gradient centrifugation, based on the instructions provided by the manufacturer. In brief, whole blood samples were layered on Ficoll-Paque Plus solution and centrifuged at 800 × g at 4°C for a duration of 30 minutes. Then, PBMC layer was extracted and washed twice with phosphate buffered saline (PBS) and centrifuged at 350 × g at 4°C for 10 minutes. After washing, PBMCs were re-suspended in PBS, aliquots stored at -80°C until analysis. Total RNA was extracted from PBMCs, using Trizol reagent (Invitrogen, Life Technologies, Germany), according to manufacturer’s instructions. The first-strand complementary DNA (cDNA) was synthesized, using a kit procured from Takara, Japan (PrimeScriptRT Reagent Kit), as per the manufacturer’s recommendations. miRNAs were quantified via qRT-PCR, using U6 miRNA as control. The qRT-PCR was carried out, using a SYBR Premix ExTaq Kit (Takara) on a QiagenRotor-Gene (Qiagen, Germany). The real-time RT-PCR reaction components included (A) 2 µL of the template, (B) 4 µL of the Master mix, (C) Primer with optimal concentration found in set up tests, and (D) Deionized distilled water to reach a final reaction volume of 20 µL. Briefly, the data were obtained as the threshold cycle (Ct) value, and the ΔCt values were determined by subtracting the average GAPDH Ct value from the average target gene Ct value. Relative expression of each gene was calculated by 2-ΔΔCt formula. Statistical tests were carried out via the Mann-Whitney test, adopted for comparing miRNAs expression difference between NSCLC patients and healthy controls. All analyses were performed with SPSS 21.0 software, and probability P < 0.05 was considered to get the statistically significant results. The miRNA-205 level of expression in 50 pairs of specimens, related to patients with tumor and healthy blood samples, were assessed by quantitative real-time PCR. Our results revealed that the miR-205 level of expression in the patients with lung cancer significantly increased in comparison to healthy controls (6.8 ± 0.42 and 1.2 ± 0.19, respectively), (P = 0.014; Figure 1). 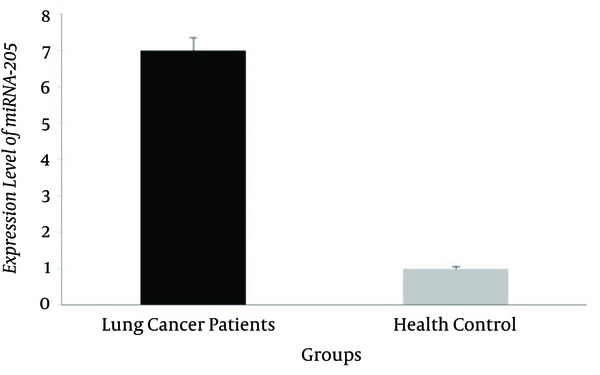 The expression of miR-21 in lung cancer (5.2 ± 0.52) compared to the control group (1.6 ± 0.14) significantly increased (P < 0.001; Figure 2). The analyzed relationship of miR-21 and miR-205 with lung cancer clinicopathological features included clinical stage, age, gender, lymphatic metastasis, differentiation degree, and surgical history. There is no statistical correlation to both miR-21 and miR-205 levels in PBMCs with clinical pathology (Table 1). Although there has been an incremental development in the survival rate of NSCLC patients, after decades of investigation, there is still a lack of real biomarkers for lung cancer diagnosis. For most cancers, blood-based proteins have been confirmed and used as biomarkers in clinical diagnosis (7). Therefore, the discovery of lung cancer diagnostic biomarkers is a critical imperative. miRNAs, a cluster of regulatory small molecular RNAs, have been associated with the progression of several cancers and some of them have been described as a potential biomarkers in cancer diagnosis. Previously, investigations have reported that the abnormal expressions of miRNAs in NSCLC tissues depend on the normal tissue of lungs (8). Initially, miR-21 was renowned as one of the most important apoptotic suppressors of miRNA in different cell linings (16). Later, a large-scale study, conducted in 540 human samples, introduced miR-21 as the only miRNA overexpressed in stomach, lung, prostate, colon, breast, and pancreas cancers. Following this report, another study recognized miR-21 as an oncogenic miRNA and demonstrated its overexpression in most types of cancer (14, 17). However, others have indicated that miRNAs in patient blood samples are either related to proteins such as lipoproteins and Argonaut (18-20) or enclosed within cellular fragments elected as exosomes, macrovesicles, micro particles, or extracellular vesicles (21, 22). Moreover, from 2008 to 2013, 154 circulating extracellular miRNAs were detected in 26 different tumor types. In this study, our research discovered that miR-21 detected in PBMCs was significantly elevated in patients with lung cancer and could be a potential biomarker for lung cancer diagnosis. Our research study also found that miR-21 is applicable for NSCLC in all stages as a biomarker. Nevertheless, there are no parallel results between the PBMC miRNA profile of NSCLC and the circulating miRNAs in extracellular plasma or serum of patients with lung cancer (23, 24). Therefore, miRNA expression in PBMCs is not similarly affected by circulating tumor cells. In addition, PBMC expression of miR-21 has been shown to be associated with other cancer types. For instance, a few studies have suggested that the assessment of miR-21 level in PBMCs could highlight cancers with the role of an anti-apoptotic factor (16). Besides, there is no similarity of the differentially expressed miRNAs of PBMC between NSCLC and other types of tumors. Our findings revealed that the expression levels of miR-205 in the patients with lung cancer increased in comparison to healthy controls. Verdoodt et al. have found that miR-205 is down regulated in prostate cancer and can be a novel regulator of the anti-apoptotic protein Bcl2 (25). Lung cancer is one of the earliest cancers that needs new biomarkers for its early diagnosis and has a poor prognosis and a mortality rate of thousands of patients per year (2). Taken together, significant progress has been made in promoting the signatures of miRNA into new biomarkers for different types of cancers, especially lung cancer. It seems that miRNA signatures are efficient markers for early diagnosis or anti-cancer therapy. However, a major challenge for cancer detection is the implementation of standardized protocols for the analysis of miRNAs. In addition, cancer therapy needs specific delivery systems for transporting miRNAs to the tumor area. Overall, a better insight into the biological function of miRNAs in cancer cells contributes not only to cancer detection, but also to cancer therapy. Overall, significant progress has been made in promoting the signatures of miRNA into new biomarkers for different types of cancers, especially lung cancer. It seems that miRNA signatures are efficient markers for early diagnosis or anti-cancer therapy. However, a major challenge for cancer detection is the implementation of standardized protocols for analysis of miRNAs. In addition, cancer therapy needs specific delivery systems for transporting miRNAs to the tumor area. Overall, a better insight into the biological function of miRNAs in cancer cells contributes not only to cancer detection, but also to cancer therapy. So, the present study is a basic study on the expression of MiRNA-21 and miRNA-205 in NSCLC patients. Large-scale and long-term follow-up studies are encouraged to confirm the significance of this potential biomarker in NSCLC. This research is a part of the efforts of the professors and colleagues of Masih Daneshvari Hospital of Shahid Beheshti University of Medical Sciences and Mashhad Medical Sciences University. All involved are sincerely thanked. Ethical Considerations: All blood samples were obtained with patients’ extensively informed written consent while in hospital, and the study was approved by the Masih Daneshvari Hospital Ethical Committee and conducted in accordance with the ethical guidelines of the Declaration of Helsinki (IR.SBMU.NRITLD.REC.1395.267). 1. Fong KM, Sekido Y, Gazdar AF, Minna JD. Lung cancer. 9: Molecular biology of lung cancer: Clinical implications. Thorax. 2003;58(10):892-900. doi: 10.1136/thorax.58.10.892. [PubMed: 14514947]. [PubMed Central: PMC1746489]. 2. Yu H, Huang X, Zhu Z, Hu Y, Ou W, Zhang L, et al. Significance of combined detection of LunX mRNA and tumor markers in diagnosis of lung carcinoma. Chin J Cancer Res. 2014;26(1):89-94. doi: 10.3978/j.issn.1000-9604.2014.02.04. [PubMed: 24653630]. [PubMed Central: PMC3937746]. 3. Yilmaz A, Damadoglu E, Salturk C, Okur E, Tuncer LY, Halezeroglu S. Delays in the diagnosis and treatment of primary lung cancer: Are longer delays associated with advanced pathological stage? Ups J Med Sci. 2008;113(3):287-96. doi: 10.3109/2000-1967-236. [PubMed: 18991241]. 4. Custodio A, Mendez M, Provencio M. Targeted therapies for advanced non-small-cell lung cancer: Current status and future implications. Cancer Treat Rev. 2012;38(1):36-53. doi: 10.1016/j.ctrv.2011.04.001. [PubMed: 21592673]. 5. Somaiah N, Simon GR. Molecular targeted agents and biologic therapies for non-small cell lung cancer. J Thorac Oncol. 2010;5(12 Suppl 6):S434-54. doi: 10.1097/01.JTO.0000391362.10517.1f. [PubMed: 21102235]. 6. Xu WJ, Su XL, Liu M. miRNA and cancer. J Dis Monit Control. 2013;5:25. 7. Chen G, Umelo IA, Lv S, Teugels E, Fostier K, Kronenberger P, et al. miR-146a inhibits cell growth, cell migration and induces apoptosis in non-small cell lung cancer cells. PLoS One. 2013;8(3). e60317. doi: 10.1371/journal.pone.0060317. [PubMed: 23555954]. [PubMed Central: PMC3608584]. 8. Winter J, Diederichs S. MicroRNA biogenesis and cancer. Methods Mol Biol. 2011;676:3-22. doi: 10.1007/978-1-60761-863-8_1. [PubMed: 20931386]. 9. Shen J, Todd NW, Zhang H, Yu L, Lingxiao X, Mei Y, et al. Plasma microRNAs as potential biomarkers for non-small-cell lung cancer. Lab Invest. 2011;91(4):579-87. doi: 10.1038/labinvest.2010.194. [PubMed: 21116241]. [PubMed Central: PMC3130190]. 10. Yanaihara N, Caplen N, Bowman E, Seike M, Kumamoto K, Yi M, et al. Unique microRNA molecular profiles in lung cancer diagnosis and prognosis. Cancer Cell. 2006;9(3):189-98. doi: 10.1016/j.ccr.2006.01.025. [PubMed: 16530703]. 11. Hummel R, Hussey DJ, Haier J. MicroRNAs: Predictors and modifiers of chemo- and radiotherapy in different tumour types. Eur J Cancer. 2010;46(2):298-311. doi: 10.1016/j.ejca.2009.10.027. [PubMed: 19948396]. 12. Seike M, Goto A, Okano T, Bowman ED, Schetter AJ, Horikawa I, et al. MiR-21 is an EGFR-regulated anti-apoptotic factor in lung cancer in never-smokers. Proc Natl Acad Sci U S A. 2009;106(29):12085-90. doi: 10.1073/pnas.0905234106. [PubMed: 19597153]. [PubMed Central: PMC2715493]. 13. Zhou X, Ren Y, Moore L, Mei M, You Y, Xu P, et al. Downregulation of miR-21 inhibits EGFR pathway and suppresses the growth of human glioblastoma cells independent of PTEN status. Lab Invest. 2010;90(2):144-55. doi: 10.1038/labinvest.2009.126. [PubMed: 20048743]. 14. Li X, Xin S, He Z, Che X, Wang J, Xiao X, et al. MicroRNA-21 (miR-21) post-transcriptionally downregulates tumor suppressor PDCD4 and promotes cell transformation, proliferation, and metastasis in renal cell carcinoma. Cell Physiol Biochem. 2014;33(6):1631-42. doi: 10.1159/000362946. [PubMed: 24902663]. 15. Tabruyn SP, Hansen S, Ojeda-Fernandez ML, Bovy N, Zarrabeitia R, Recio-Poveda L, et al. MiR-205 is downregulated in hereditary hemorrhagic telangiectasia and impairs TGF-beta signaling pathways in endothelial cells. Angiogenesis. 2013;16(4):877-87. doi: 10.1007/s10456-013-9362-9. [PubMed: 23800974]. 16. Chan JA, Krichevsky AM, Kosik KS. MicroRNA-21 is an antiapoptotic factor in human glioblastoma cells. Cancer Res. 2005;65(14):6029-33. doi: 10.1158/0008-5472.CAN-05-0137. [PubMed: 16024602]. 17. Schramedei K, Morbt N, Pfeifer G, Lauter J, Rosolowski M, Tomm JM, et al. MicroRNA-21 targets tumor suppressor genes ANP32A and SMARCA4. Oncogene. 2011;30(26):2975-85. doi: 10.1038/onc.2011.15. [PubMed: 21317927]. [PubMed Central: PMC3134876]. 18. Moldovan L, Batte KE, Trgovcich J, Wisler J, Marsh CB, Piper M. Methodological challenges in utilizing miRNAs as circulating biomarkers. J Cell Mol Med. 2014;18(3):371-90. doi: 10.1111/jcmm.12236. [PubMed: 24533657]. [PubMed Central: PMC3943687]. 19. Arroyo JD, Chevillet JR, Kroh EM, Ruf IK, Pritchard CC, Gibson DF, et al. Argonaute2 complexes carry a population of circulating microRNAs independent of vesicles in human plasma. Proc Natl Acad Sci U S A. 2011;108(12):5003-8. doi: 10.1073/pnas.1019055108. [PubMed: 21383194]. [PubMed Central: PMC3064324]. 20. Vickers KC, Palmisano BT, Shoucri BM, Shamburek RD, Remaley AT. Corrigendum: MicroRNAs are transported in plasma and delivered to recipient cells by high-density lipoproteins. Nat Cell Biol. 2014;17(1):104. doi: 10.1038/ncb3074. 21. Hunter MP, Ismail N, Zhang X, Aguda BD, Lee EJ, Yu L, et al. Detection of microRNA expression in human peripheral blood microvesicles. PLoS One. 2008;3(11). e3694. doi: 10.1371/journal.pone.0003694. [PubMed: 19002258]. [PubMed Central: PMC2577891]. 22. Mitchell PS, Parkin RK, Kroh EM, Fritz BR, Wyman SK, Pogosova-Agadjanyan EL, et al. Circulating microRNAs as stable blood-based markers for cancer detection. Proc Natl Acad Sci U S A. 2008;105(30):10513-8. doi: 10.1073/pnas.0804549105. [PubMed: 18663219]. [PubMed Central: PMC2492472]. 23. Sozzi G, Boeri M, Rossi M, Verri C, Suatoni P, Bravi F, et al. Clinical utility of a plasma-based miRNA signature classifier within computed tomography lung cancer screening: A correlative MILD trial study. J Clin Oncol. 2014;32(8):768-73. doi: 10.1200/JCO.2013.50.4357. [PubMed: 24419137]. [PubMed Central: PMC4876348]. 24. Jarry J, Schadendorf D, Greenwood C, Spatz A, van Kempen LC. The validity of circulating microRNAs in oncology: Five years of challenges and contradictions. Mol Oncol. 2014;8(4):819-29. doi: 10.1016/j.molonc.2014.02.009. [PubMed: 24656978]. [PubMed Central: PMC5528532]. 25. Verdoodt B, Neid M, Vogt M, Kuhn V, Liffers ST, Palisaar RJ, et al. MicroRNA-205, a novel regulator of the anti-apoptotic protein Bcl2, is downregulated in prostate cancer. Int J Oncol. 2013;43(1):307-14. doi: 10.3892/ijo.2013.1915. [PubMed: 23612742].